Pretty cool that you’ve read Canticle already. 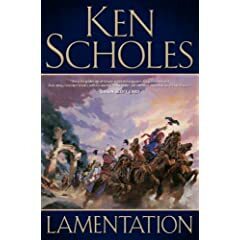 I have an arc of Lamentation which I bought off the net but I will buy the hardcover anyway when it comes out on the 17th. Looking forward to Canticle even more. Anyway, nice feature, do continue with it. Godlike Machines- When is this due? And is there a table of contents? Conquering Swords anthology- When is this due? Also, what can you say about who will be in it? Legends- Which you’re doing with Dann, what is that all about then? I was impressed with Ken Scholes’ short story, Invisible Empire of Ascending Light, in the Eclipse Two collection when I read it a couple of nights ago. He packed quite the story in those short pages and when I was finished I was both satisfied with what he was able to do and interested in seeing what he would do with an entire novel written in that same universe. 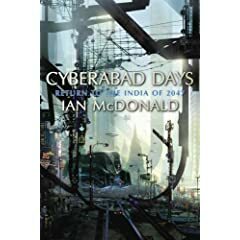 I added Cyberabad Days to my mental list to keep an eye out for when I saw it listed on someone else’s site the other day. The Martiniere cover caught my eye immediately and though I have not read McDonald, I have read so many positive things about him that this collection seemed like a great opportunity to try him out. I just wanted to drop by and say how much I enjoy your “looking forward” posts. I’m looking forward to #3. Thanks Susan. I should get the next one up in the next day or so. Previous Previous post: Hugos for sale?